You can see the River Derwent right when you touch down in Hobart. 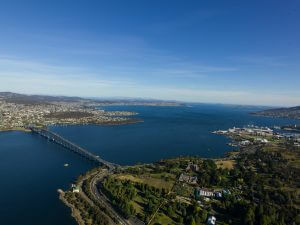 This river begins 700 meters above Tasmania's largest city and brings its crystal clear waters to the mouth of a river flowing by Hobart CBD. It empties into Storm Bay which flows into the indomitable Tasman Sea. You'll have to head into central Tasmania to see where this wild river begins. Drive up to the appropriately named Derwent Bridge where the waters of the river pour out of Lake St. Clair in the southern reaches of the Cradle Mountain-Lake St. Clair National Park. River Derwent flows more than 200 kilometers and drops more than 700 meters from its origin in the national park. It is formed by the collision of the Narcissus and Cuvier Rivers at Lake St. Clair and flows with the power of 50 to 140 m³ per second. It pours into a large estuary at the city of Hobart where you can find the deepest sheltered harbour in the Southern Hemisphere. Dams of the Derwent have caused 7 lakes to be formed -- Meadowbank, Cluny, Repulse, Catagunya, Wayatinah, Liapootah and King William. The river is important for hydroelectric power as well as for agriculture, forestry and fish hatcheries. You can find the origin of this River in one of the most beautiful places in all of Tasmania -- the Cradle Mountain-Lake St. Clair National Park. It is one of the rivers you'll find at Derwent Bridge in the heart of the Tasmanian island. Here you can explore the national park on foot with many beautiful walking tracks around the lake and rivers in the area. The entire southern edge of this National Park is crowned by snowcapped mountains, and you can even take a ferry around Lake St. Clair to explore the river's origination point at Narcissus Bay. 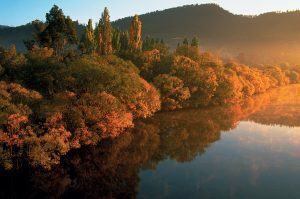 The Mouheneener people inhabited the area of the Derwent River Valley for more than 8,000 years before European settlers arrived. Evidence of their inhabitants can be found along the river banks and artifacts are still unearthed today. But the river was given its modern name by John Hayes in 1793 when he named it after a river in near his hometown in Britain. The origination of this River is quite a sight to see. The southern reaches of the Cradle Mountain-Lake St. Clair National Park is where you'll find Lake St. Clair, Narcissus Bay and the Cuvier River. It can all be explored from the small base camp town of Derwent Bridge in the middle of the island.